A US citizen was killed in the Egyptian port city of Alexandria on Friday during clashes between supporters and opponents of President Mohamed Morsi, bringing the city's total death toll on Friday to two. The American man died from a stab wound to the chest, according to Amin Ezz El-Din, head of Alexandria's security directorate. Ezz El-Din said the young American had been taking pictures with his mobile phone near one of the offices of the Muslim Brotherhood, the group from which President Morsi hails, when he was attacked by unknown assailants. The victim was rushed to a military hospital where he succumbed to his injuries. Security sources told Ahram Online's correspondent that the victim's name is Andrew Pochter. He was a 21-year-old photojournalist. The details have not yet been officially confirmed. The report of his death was confirmed by Ibrahim El-Roubi, head of emergencies at Alexandria's health department, along with two other security officials. In May, American academic Chris Stone was stabbed in the neck outside the US embassy in Cairo. Stone, however, survived the attack. Stone's attacker, Mahmoud Badr, 30, a commerce graduate, told interrogators that he had travelled to Cairo by train from Upper Egypt's Kafr El-Sheikh with the specific intention of killing a US national, Al-Ahram's Arabic-language news website reported. 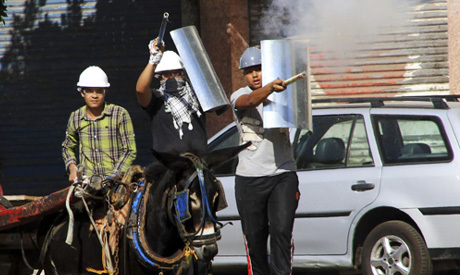 An Egyptian protester was also killed Friday in Alexandria in clashes between supporters and opponents of President Morsi. "All kinds of weapons, including live fire" were used in the melee, said Ezz El-Din. CORRECTION: The victim is 21 years old and not 28 as previously mentioned. The oppositions don't kill, this is the act of the Islamist since they think foreigners are danerous to Egypt. I am a foreigner,and stand no side of the current conflict. But I want to ask each Egyptian. Why MB got "the sympathy of the poor and ignorant masses of Egypt"? Because they helped poor people.Where were you when your nations suffer from poverty? How many times did you visit hospitals and mosque for helping poor people...How many times did you listen to the poor around you and thought together to solve the problem? Then after "democratic" election, the result was Mursi. That means the "majority" are poor, and suffered so much, they had no one but MB. So who should ashamed himself. If only rich people paid more attention to the poor and gave more care to them, Mursi might not have gotten so much votes. You may call them "ignorant", but many rich people were also "ignorant" if what people around them need. Taking pictures is dumb especially a foreigner. It's sad but some people are naive and just don't see the danger. The common Egyptian attitude: Never take responsibility and find a way to blame someone else. Baradei and his allies are blaming on everybody with their failures. They are blaming Obama for funding MB. They are now stabbing our guests. I hope authorities should be on heavy hand with these thugs. accusing people without evidence is not acceptable.These people on the streets are true Egyptians revolting against a fascist regime and actually many of them voted for morsi who turned out to be a dictator using religion to gain the sympathy of the poor and ignorant masses of Egypt. It is a tragedy that anyone dies whether a supporter or anti morsei, and definitely a shame that any foreigner is amongst any of the victims as this was not his battle.